Spanning 11 time-zones, The Russian Federation is the largest country on Earth by some margin. Over three quarters of its population reside in the smaller Western segment, geographically divided from the rest of the nation by the Ural Mountains. Many writers and thinkers have attempted to outline and illustrate the psyche of its peoples, putting emphasis on pride, asceticism and passion, but also a kind of indifference. With its tumultuous and mystifying past, contemporary Russians are often seen as unpredictable and somewhat cold, but beneath their hard exterior there are countless layers of warmth, dependability, sincerity and generosity. So how do you disassemble this matroyshka façade? One contributing factor is Russia’s fluctuating identity, Peter the Great shook off the dust of the Slavic past by initiating a more European dress style and ordering the removal of beards. Later, Slavophiles swept up the remains and opposed westernisation, creating a deeply divided nation. This ideological disunion has led to flourishing periods of creative expression, with some of the best literature, art, and classical music the world has to offer. Culture Smart! Russia offers you an insight into the workings of a deeply complex nation and peoples, and will fill both tourists and businessmen/women alike with the confidence to thrive. 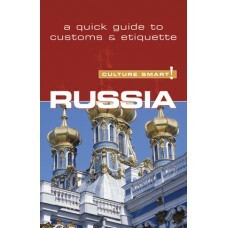 It will give you an overview of Russian history and culture past and present, and how to communicate with Russians, while allowing you to embrace their quirks and idiosyncrasies.